Brexit has made Paris bolder. Once Britain leaves Europe’s single market, the many international banks and other firms that have made London their EU home will lose the “passports” that allow them to serve clients in the other 27 states. Possibly, mutual recognition by Britain and the EU of each other’s regulatory regimes will persist. But no one can rely on the transition to Brexit being smooth, rather than a feared “cliff edge”. Best to assume the worst. 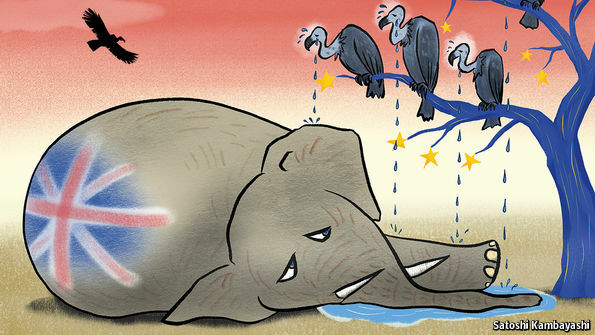 Britain is expected to start the two-year process of withdrawal next month. Given the time needed to get approval from regulators, find offices and move (or hire) staff, financial firms have long been weighing their options. London will remain Europe’s leading centre, but other cities are keen to take what they can. The Parisians are pushing hardest, pitching their city as London’s partner and peer. “I don’t see the relationship with London as a rivalry,” says Ms Pécresse. “The rivalry is not with London but with Dublin, Amsterdam, Luxembourg and Frankfurt.” Especially, it seems, Frankfurt. Paris has more big local banks, more big companies and more international schools than its German rival. London apart, say the French team, it is Europe’s only “global city”. When, they smirk, did you last take your partner to Frankfurt for the weekend? This month the Parisians were in London, briefing 80 executives from banks, asset managers, private-equity firms and fintech companies. They are keen to dispel France’s image as an interventionist, high-tax, work-shy place. The headline corporate-tax rate is 33.3% but due to fall to 28% by 2020. A scheme giving income-tax breaks to high earners who have lived outside France for at least five years will now apply for eight years after arrival or return, not five. The Socialists, who run the city itself, and Ms Pécresse’s Republicans are joined in a business-friendly “sacred union”, says Gérard Mestrallet, president of Paris Europlace, which promotes the financial centre. Ms Pécresse and others play down the risk that Marine Le Pen, of the far-right, Eurosceptic National Front will win the presidential election this spring. More quietly, Hubertus Väth of Frankfurt Main Finance (the counterpart of Paris Europlace) is “pretty confident” about his city’s ability to attract more bankers. To Mr Väth, the big prize is the clearing of trades in euros, which London dominates but which both Frankfurt and Paris hope to snaffle. The European Central Bank once tried to force clearing to move from London to inside the euro zone, but was thwarted in 2015 when EU judges ruled it lacked the necessary authority. After Brexit, it may try again. Nicolas Mackel of Luxembourg for Finance, the grand duchy’s development agency, is relatively “laid back”. All are welcome, Mr Mackel says, but no taxes or regulations have been changed, nor applications fast-tracked. Business has been brisk anyway, because of the duchy’s expertise with fund managers. China’s big banks use Luxembourg as a continental hub. After a slow start, the Dutch too are trying to gain from any “Brexodus”. The foreign-investment agency has expanded its (small) office in London. The Netherlands offers a high quality of life and almost everyone speaks English. But Amsterdam’s financial centre lacks the scale of Frankfurt or Paris, and is short of housing and schools. A cap of 20% of salaries on bankers’ bonuses is also off-putting, although the finance ministry says global banks may be exempt under certain conditions. Dublin is keen to attract more asset managers. Irish central bankers are worried about whether they have the right expertise to regulate, say, complex trading. Some would be relieved if the hordes do not materialise. The city is already short of office space, housing, roads and international-school places. The size of the prize is hard to gauge. Much depends on the post-Brexit agreement between Britain and the EU, and what regulators demand in capital and personnel. Banks may also shift some work out of Europe, to New York, or even Hong Kong or Singapore. Some services, warns a banker, may not be provided at all. Mr Väth thinks that, with euro clearing, Frankfurt could see an extra 10,000 jobs or more. Arnaud de Bresson of Europlace estimates that Paris stands to gain 10,000 “direct” posts in finance and fintech, plus 10,000-20,000 in law, accountancy and so on. Europlace hasn’t tried to quantify the number tied to clearing. Different institutions have their own priorities. HSBC, a big British bank, has already said that it expects to move around 1,000 jobs to Paris, where it already has a subsidiary; some other banks still sound wary of the place, despite the best efforts of the French. Switzerland’s UBS, which also says around 1,000 London jobs are at risk, set up shop in Frankfurt last year: that seems a natural base, although its bosses have also mentioned Madrid. Fund managers not already in Dublin or Luxembourg are likely to head there. Lloyd’s of London, an insurance market, and Blackstone and Carlyle, two American private-equity giants, reportedly favour Luxembourg for their EU home. The continental European financial centres all say they have acres of space for new arrivals. There should be more than enough, at least for now. “We’re not talking about banks moving lock, stock and barrel,” says Lee Elliott, head of commercial research at Knight Frank, a property consultancy. All banks have bases in all the main centres and after the downsizing of recent years, they still have vacant space. James Maddock of Cushman & Wakefield, another property-services firm, says that since 2008, banks in Europe have shifted 34,000 back- and mid-office jobs to eastern Europe, a further 5,050 to Ireland and 14,200 to British cities outside London. Brexit will involve fewer (if better-paid) people. But in all the cities vying for post-Brexit trade, a common refrain is heard: we wish it wasn’t happening. In Luxembourg too, Mr Mackel says, an ad was planned for the day after the referendum: “We would have missed you.” It didn’t appear.